Few products are absolutely necessary to have great curly hair, but some of the below do make it a bit easier and are excellent occasional treats. I’m no scientist and certainly not a trained hair stylist, but these are the products that have worked best for me after roughly 15 years of rigorous experimentation. Please note that when purchasing hair products, it’s the ingredient list on the back that matters — not the fancy marketing text on the front. These have been vetted by me, and over time you will come to recognize the ingredients to avoid (i.e. : some sulfates and silicons) and which ones to embrace (i.e. : glycerine and aloe). More will be added as I try them! No offense to the grand folks at Aussie, but this is my “cheap conditioner.” In fact, they should be quite proud, as this is the only brand I will purchase from a drug store. I’m sure I could spend hours trying to find a comparable product, but it’s inexpensive, easy to find, and doesn’t contain sulfates or chlorides. It does have alcohol as one of the main ingredients, which isn’t great, but it works well enough in oil treatments and for scalp scrubbing. This is the highest-quality conditioner that I’ve found, and I use it for all regular conditioning. This is what I refer to when I am not talking about the “cheap conditioner.” I also use it in oil treatments sometimes when my hair needs extra lovin’. It has nothing but the best ingredients, smells great, and a little goes a long way. It’s not cheap, but it’s worth it. This conditioner is definitely one of my favorites, despite the lofty price tag. It uses organic ingredients and is very thick, so a little goes a long way, meaning you don’t spend as much as you might think. It comes in Rosemary and Peppermint; both of which are refreshing scents and pack a ton of essential oils to revitalize hair. Agadir’s Argan Oil conditioner is a good one to add into the rotation, but it’s not my favorite. The smell can be overpowering, but this is good if you plan on going to the gym or sweating a lot at some point that day — the fresh scent will hold up and will release while you sweat, and after! This product has been fully reviewed in WEN in Doubt, Try it Out!, and I love it. It normally comes in Pomegranate, Cucumber Aloe, Lavender, Sweet Almond Mint, Tea Tree, and Fig. I purchased the indulgent Summer Mango Coconut from the seasonal collection. As far as hair masks go, this is one of my favorites. It does wonders on hair when left on overnight, and can be rinsed out with a sulfate-free cleanser, seen below. The lemon juice-conditioner mixture is not necessary to wash out masks, that is more beneficial when using heavier oil treatments. Apply masks to your scalp as well as your hair. This splurg-y mask is made of all natural ingredients and is wonderful for overnight treatments. As with any overnight treatment, cover masked hair with a treatment cap, tie on tighter with a bandana, go to sleep and wash it out in the morning. You may want to use a sulfate-free cleanser to get it out. Apply masks to your scalp as well as your hair. This is my favorite hair oil treatment. It’s light enough to apply a drop of it to hair when it’s dry and needs a little moisture, and it smells a bit like creamsicles (to me, anyway). I also use this as an overnight treatment and concentrate on ends when I have a lot of splitting and breakage. It’s not as intense as an oil treatment or mask, but it’s a quick and easy pick-me-up that can be left in and won’t look greasy or sticky. Cleanser is not needed to remove it, it will rinse out with water the next time you wash.
I’ve said in the past that I don’t use anything other than gel to style my hair, and anything else is a waste. I’ve been proven wrong! Hair creams have come a long way as of late, and this is my favorite. It has a lot of healing ingredients to moisturize your hair, and isn’t sticky or stiff. It allows hair to dry in a caste like gel does, but easily releases when hair is dry and allows strands to feel softer than ever. When I use this, I only wash out about half of the conditioner soaked into my hair, towel dry, and apply it by raking it through my ends. The moisturizing duo of conditioner and styling cream is perfect for summer hair that’s been blasted with heat, UV rays, chlorine, salt water, and sweat. This is my favorite base gel, and I use it pretty much every time I do my hair. This is the gel I put on in the shower, immediately after the conditioner. It’s a great conditioning gel and smells really nice, definitely worth buying. I sometimes use it alone, but if it’s humid out I also use a finishing gel. This little beauty does wonders as a self-described “finishing gel.” For me, this means that I use it as the very last thing that I put on my hair while wet. My particular routine is to leave some conditioner on the ends in the shower, hand-squeeze out excess water and add a small amount of Devachan’s Angel concentrating on ends. Then I get out of the shower and carefully towel dry my hair by blotting it with a soft towel. Next I use another small amount of this to pack in nourishing frizz control that leaves my hair feeling soft and very manageable with just the right amount of control. This is what I call my “finishing gel.” Once I’m out of the shower and have towel dried my hair, I *lightly* coat it with this gel. A very little bit so it doesn’t get too sticky. Too much product can be a very bad thing, you always want to monitor the amount you use. Now that your hair is health and well-conditioned, you won’t need as much gel. Always err on the side of less is more. When it’s dry and you’ve broken the “cast” set by the gel (the “scrunching” process we gel users all know and love, but scrunch with the same downward motion we’ve been using, only scrunch upward to increase curliness) it should look and feel clean, shiny, and not sticky or “wet” at all. I only use this on extra humid days, or days that I know my hair will be more prone to frizz. Normally it is not necessary to use more than one gel. I do enjoy all of Ouidad’s gels, but this has been my favorite so far. I suggest trying them all. (Note: Hair gets used to products, I have no idea how. But switching them up now and then seems to help). I rarely tell you to use anything on your scalp, because like the rest of your skin it needs to breathe. When I feel scalp pains or dryness I rub a touch of quality conditioner on it like hand lotion, but that’s about it. However, in the months when volume is a bit of a problem, this spray works like a pro and doesn’t appear to have any negative effects. I’ve been using it only after washing my hair, so about once or twice a week, for the past six months and it truly does lift my roots and add shine. Simply angle your head and spray about three spritzes on each side, putting the nozzle just inside your hair so you target the roots. No further rubbing or touching necessary, and you want to touch your hair as little as possible while it’s still wet. If you notice that your scalp is getting greasier, simply cut back to using it only for special occasions. I only use this when I am about to straighten my hair. For me, that’s maybe 5 or so times a year. It has a small amount of the harsher cleansers, so this is the closest to shampoo that you should ever get. It’s probably akin to the “lather-free” shampoos you can buy in health food stores, but I’ve never really looked at their ingredients. It works well at getting all grit and grime out, and your hair won’t feel or look greasy at all once you’ve straightened it. When I want to cheat a little bit and not use the full-on lemon juice + conditioner mix (4 tbsp conditioner + 4tbsp EVOO, as detailed in the Oil Treatment page), this is what I use. It contains zero harsh chemicals, and is a great conditioning cleanser. You’re not hurting your hair at all by using it, and the peppermint extract in it is good for your scalp. Have you ever noticed how great your hair looks at the beach? The sea salt and humidity have a restorative effect on our locks, but without proper moisture it can make them too dry over time. 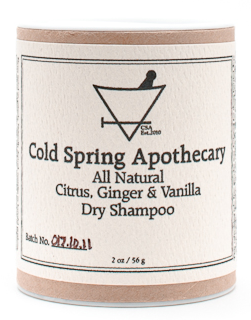 This sea salt spray from Cold Spring is a definite splurge, but every time I need to freshen up next-day hair it goes above and beyond. Coconut and jojoba oils condition while the dead sea salts coax out cool texture and volume. It restores life and bounce to worn-out curls, and the product’s scent is AMAZING. This little sucker ain’t cheap, but it’s hair gold. It was reviewed in Wen in Doubt, Try it Out! and is genius at replenishing tired, greasy, dull hair that just needs a little lift between washes. We who don’t wash our hair every day sometimes need a little help from dry shampoo, I think you know what I’m talking about. This one, however, has none of the harmful ingredients (talc, if you haven’t heard, is bad) that traditional yucky sprays and powders have. It also has a great scent of the outdoors and happy times, so I highly suggest sprinkling some of it on itchy and oily patches of scalp between shampoos. Since you have curly hair, don’t brush it through your strands, just rubbing it into the scalp will be enough to help you. I am pretty confused right now!!! Got rid of ALL shampoo and all my conditioners (all but one had sulfates or Chlorides in them). Are all Chlorides bad? I just got the Devacurl One Conditioner (that you recommend) was looking at the ingredients and it has some chlorides in it!!! Also when do I comb my hair? SOOOO excited about doing this for my hair! Haven’t shampooed in almost 2 weeks! Hair isin’t bad yet though! Thanks for posting all this! Hi Joanna! Thanks for reading, glad you’re enjoying it and so excited that you’re getting on the bandwagon. The fact that your hair isn’t bad yet proves you really should be doing this! I wrote a post about this because it is confusing, there are some “good” chlorides so I suggest Google-ing them if you see something suspect in your product ingredients. Check out my post on this: (https://curlyqa.com/2012/03/07/not-sure-about-an-ingredient-google-it/), hope it helps! Never comb your hair, just finger-comb the product through your hair as lightly as you can in the shower while it’s wet. Think of it this way: The more you mess with your hair, the more apt it is to get frizzy since you’re ruffling the hair cuticle. Sometimes when I don’t care how my hair turns out it looks better than when I put a lot of effort into it! If you absolutely have to brush your hair, use a wide-tooth comb (http://www.sallybeauty.com/conditioning-comb/SBS-373807,default,pd.html?cm_mmc=iPfeeds-_-GoogleShopping-_-Hairbrushes,_Combs_&_Piksstyling_Combs-_-SBS-373807) and only when it’s wet and silky with conditioner. Ok it has been 4 weeks and my hair has not gotten greasy or my scalp itchy!! I have been doing everything right and using the exact products that you suggested using. Is this normal? Hope I’m not doing anything wrong! Also I’m still kind of having a problem with my hair getting frizzy. Do I need to not wash out as much conditioner? I try not to ruffle it all or comb it. How much conditioner do you use? Your hair should be completely saturated, and let it sit in your hair for about 5 minutes while you shave, wash your face, etc. My hair is down to the middle of my back, but thin and layered, so I use about 2 quarter-sized dollops, one on both sides of my head. On days that my hair feels dryer I use more, as your hair should feel completely silky and seaweed-like when the conditioner is in. Your scalp should be massaged with conditioner that is washed out first, then you should take the two dollops and rake them through your hair after that, mostly concentrating on your ends. I’m surprised that you’ve just stopped using shampoo for the first time in your life and your scalp still isn’t itchy, but this is fine, just keep up with it. Also, use the oil treatment in my blog once a week and that will help a lot with frizz and dryness. Give it at least another month before you freak out, your hair will look better as each month, and then each year, goes by, it’s not an overnight fix. But you should definitely start seeing improvement, and having less “bad hair days” by month 2. Keep me posted! I have been using the devacurl no poo, one conditioner and their styling products for a while now and my hair looks limp and dull with little body as to when I used to use the products like Redken and the cheap stuff. Any suggestions to add body and get my curls back? Hey Renee! It’s imperative to deep-condition around once a week. You can do that by using the oil treatment on my nav bar, or the masks on my products page. The former is free (well, uses cheap household ingredients) and the latter are pretty pricey, but you don’t need to use too much to make a dent. Sleep with whatever you use on your head overnight, covered in a plastic cap and a bandana to hold it on, and rinse it out with 4 tbsp conditioner (Aussie Moist will do the trick and is less expensive) and 4 tbsp of pure lemon juice from the grocery store in the morning. That rinse will get rid of all of the product residue and build-up (better than any shampoo), and if your hair doesn’t look amazing after doing those things you can smack my face and call me Sally. (Not really). But it does need to be done every other week at the least to be continually effective. Our hair needs lots of moisture to thrive. Air conditioning, heating, wind, sun, BLOW DRYERS, etc. all deplete it and steal it’s shine and vigor! Thanks! I don’t normally sleep with anything on my hair which I know is bad but I’m afraid I will wake up with my dog stealing it. I will try it out and let you know how it goes. Thanks! P.S. Congrats on the engagement! Thanks!! Lol that’s hilarious, tell him to mind his own business. So I did some of the tips you mentioned and used the mask and the oils and lots more conditioner and my hair is so much healthier and has so more body to it! Thanks!